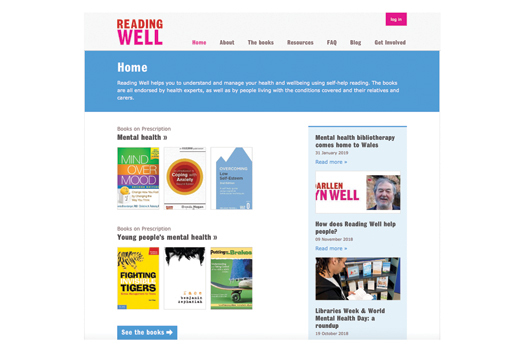 When The Reading Agency and Libraries Connected launched their first Reading Well Books on Prescription adult mental health list in public libraries in 2013, expert-endorsed helpful reading could be recommended or “prescribed” by health professionals and the books were also were available for anyone to borrow from public libraries. Reading Well was integral in positioning public libraries as community hubs that people could turn to for evidenced-based mental health support. Five years later, the scheme is now available in 98 per cent of English public library authorities and has expanded bilingually to all Welsh authorities with funding from the Welsh Government. Almost a million people have borrowed over two million Reading Well books from their local library. 89 per cent of health professionals surveyed in 2018 responded that using the scheme had helped their patients better understand their condition. The final list embraces the core principles of evidence-based practice and accessibility and provides both book-based therapy and the insight of personal experience. We can’t overemphasise the value of narratives and personal stories in mental health discourse for breaking down stigma, making people feel less alone and for helping health professionals to better relate to patient’s perspectives. The Reading Agency exists to tackle life’s big challenges though the proven power of reading, and Reading Well is a vital free mental health resource available for anyone to access in their local community. ‘As the British Psychological Society’s representative on Reading Well Books on Prescription since 2013, I’ve had input into the development of the scheme and the book selection process. It has been highly educative to hear the views of all the many and varied partner organisations, and to focus on enabling the process and final outcome to move towards concensus… it’s often required the skills of an experienced mediator! This task has been ably led by the Reading Well Team, and it’s proving exciting and stimulating to be a part of this process.